On 24 August, the Brent oil price fell to $43, which was close to a 7-year low. Although Belarus has not got its own crude oil, this is terrible news for its economy. The cheaper the oil, the lower are benefits from the energy subsidies to Belarus from Russia. Over the last 20 years Belarus has maintained, relatively successfully, a quasi-socialist economy mostly thanks to the generous economic aid from Russia. Under Lukashenka’s rule Russia's unprecedented economic support has amounted to a dozen or so per cent of Belarusian GDP annually. But the decline in the world oil and gas prices limits the benefits for Belarus. Both government and non-government economists agree that Belarus benefits from a good relationship with Russia. For instance, in 2012 due to favourable energy prices Belarus saved $10 billion or 16% of GDP, according to the Economic Institute of the Belarusian National Academy of Sciences. Using the same methodology would suggest that the average level of Russian subsidies over the last two decades reached the equally incredible level, around 15% of Belarusian GDP annually. Belarus has the lowest gas price in the region, apart from Russia itself. Until 2007 the gas price was three-to-five times cheaper than for Poland. Then, Russia gradually raised the price for Belarus while still offering Belarus the best deal in the region. In 2014 gas for Belarus cost $170 per 1,000 m3 which is 55% less than for Poland. If Belarus were to pay the market-based price similar to the one Poland pays it would cost it almost $4.2 billion more or 5.5% of its GDP. In addition, Belarus takes advantage of duty-free oil for its own needs, saving another one or two billion dollars annually. For example, in 2014 Belarus bought one ton of crude oil for $395, only 55% of the average world price, which meant over $2 billion of savings (2.7% of GDP) throughout the year. With hardly any oil resources inside the country, Belarus belongs to the Top-10 net exporters of petroleum products in the world, according to the International Energy Agency. Until 2007 Belarus imported duty-free crude oil at a price close to the Russian domestic one and processed it at its two refineries. Belarus used a third for domestic needs and exported the rest to the West at market prices. This profit added several billion dollars a year and boosted the ineffective economy. When the Kremlin wishes some concessions from Lukashenka, it often engages its energy leverage. Since 2007 Russia tried to conduct more market-oriented economic relations with Belarus in the oil trade. In 2007-2010 Belarus had to pay approximately 30% of the duty applied to other recipients of Russian crude oil. It was the first time when the energy subsidies shrank. In 2011 Russia obliged Belarus to transfer to the Russian budget export duties on petroleum products made with Russian oil and exported outside the Customs Union. To sweeten the pill Belarus again could import duty-free crude oil. Yet, in 2011-2014 Belarus transferred to the Russian budget $2.9-3.8 billion of these duties annually. This is quite a lot when compared to the pre-2007 period, when Belarus paid no duties at all. At the signing of the Treaty establishing the Eurasian Economic Union in 2014, Russia agreed to keep $1.5 billion of petroleum products' duties in the Belarusian budget in 2015 and perhaps more in 2016. Subsequently Russia introduced tax reform to increase internal tax on extracted oil and lower export duties on petroleum products. As a result, Belarus would pay approximately one billion dollars more for imported oil while potential future gains from leaving duties on exported petroleum products in Belarus would decrease. In exchange for generous energy subsidies, Lukashenka vows to strengthen political integration between the two countries, which can be seen as paying Russia back. Yet often he has withdrawn his promises and Russia still tolerates his behaviour. After all, Russia does not have that many friends in the world these days. In a challenging situation Lukashenka almost always finds a way to cool the Kremlin's economic pressure. In 2010-2012 he surprised his Russian colleagues by importing oil from Venezuela and Azerbaijan. Both initiatives lacked economic sense but they strengthened Minsk's bargaining power against Moscow. Semi-legal exports of so called solvents and thinners counts as another excellent scheme. In 2011 and the first half of 2012 Belarus traded Russian petroleum products under the guise of goods which remained duty-free according to intergovernmental agreements. As a result, the Russian budget lost about $3 billion in duties. 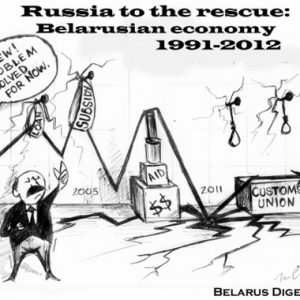 In the second half of 2012 Russia forced Belarus to curtail this “business”. Recently, Belarus has also taken the opportunity of the Russian food product embargo on Western countries, delivering "Belarusian" shrimps, "Belarusian" salmon, "Belarusian" Parmesan and many other goods exported from the West to Russia under the "Belarusian" brand. No other country or regional union could give to Belarus as much as Russia. To compare, the net direct gains of Poland from the EU in 2004-2014, included structural funds, add up to around three per cent of GDP annually. It is five times less than Russian energy subsidies to Belarus in the same period. Nevertheless it is Poland that grew faster. The Belarusian authorities drive a hard bargain, ensuring cheap energy resources, positive duty-free trade, and preferential credits, for little in return. Discounted energy resources from Russia have provided competitiveness to the Belarusian economy for the last two decades. Only in 2014, the energy subsidies for Belarus, resulted from discounted prices on gas and duty-free oil for own needs, climbed to over $6.2 billion or 8.1% of GDP. 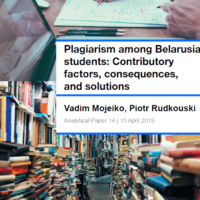 Unfortunately, having a permanent energy grant, the Belarusian authorities did not even think about reforms. Previously, they could reach out for more help and find convincible arguments for the Big Brother to give another discount. However, plunging oil prices automatically leads to significant reduction in the Russian energy bonus for Belarus, since the difference in price for Belarus and the rest of the world decreases. With no exceptional resources it will be challenging for Lukashenka to keep the ineffective economy alive. The summer holidays proved to be productive for the relations of Belarus with both "old" and "new" Europe. Foreign minister Vladimir Makei ended a continued pause in high-level contacts with Belarus' southern neighbour by an unconventional five-day long visit to Ukraine in mid-August. There, he took the risk of enraging Russia by meeting its mortal foe Mikheil Saakashvili in Odessa. The EU Council significantly reduced its sanctions list against Belarus on 31 July and a US congressional delegation came to Minsk two days later. In exchange, Minsk agreed to discuss human rights with its Western partners, seemingly ending a long tradition of denial of any major problems in this sphere. Will Minsk's diplomacy manage to continue befriending Russia's foes without alienating its main sponsor until right after the October presidential election? On two separate occasions in July, the EU Council removed 26 persons and 4 companies from its Belarus' sanctions list. On 3 August, the Belarusian foreign ministry called this decision "a step in the right direction yet insufficient" and conditioned the normalisation of relations between Belarus and the European Union by the full withdrawal of restrictions. On 28 July in Brussels, Belarus and the EU held the first round of a human rights dialogue at the level of experts. Two months earlier, on 14 May, Belarus conducted similar consultations with the United States in Washington, DC. On 2 – 4 August, a three-person US congressional delegation led by Dana Rohrabacher, the chairman of the subcommittee on Europe, Eurasia and emerging threats visited Belarus. In Minsk, the congressmen met with President Lukashenka, deputy foreign minister Alexander Guryanov, and National Bank chairperson Paviel Kalavur. The parties discussed bilateral relations, human rights and democratisation issues, the state of the Belarusian economy, and regional security, including the crisis in Ukraine. These decisions and meetings hardly represented a chaotic chain of events. They manifest specific agreed steps in the step-by-step strategy adopted by Belarus and its Western partners in the run-up to the 2015 presidential election. In the near future, one should expect more similar events. The release of Mikalaj Statkievich, the most prominent political prisoner in Belarus, at which Lukashenka hinted during his interview to independent media outlets on 4 August, may become one of the key items in the list. Ukraine: Trade, Peace-making or Both? Belarusian foreign minister Vladimir Makei surprised many observers with his unusually long 5-day visit to Ukraine. Belarusian media provided scarce coverage to this trip, which took place on 12 – 16 August. The fact that public opinion in Belarus predominantly sympathises with Russia in its conflict with Ukraine may explain this discretion. In Kyiv, Vladimir Makei met with his counterpart Pavlo Klimkin and Ukrainian president Petro Poroshenko. The parties claimed to have discussed a wide variety of issues, from cooperation in international organisations to joint projects between Belarusian and Ukrainian regions. Two issues clearly dominated in the visitors' agenda: the conflict in southeast Ukraine and trade relations. The Belarusian minister seized the opportunity to re-emphasise Belarus' merits in the peace process. However, he took care to restrict the country's role to technical and logistic support for the negotiations, stressing that Belarus had no ambitions as a peacemaker. Makei's insistence on the need of strong adherence of all parties in the conflict to the Minsk agreements served to avoid unduly worrying or alienating Russia. At the same time, answering a question from a Ukrainian journalist, he unequivocally recognised Donetsk and Luhansk regions as an integral part of Ukraine. The visit's topmost priority was the trade relations between the two countries. In 2014, Ukraine was Belarus' second-biggest export destination. The war in Ukraine and the economic crisis in the region led to a 46.2% drop in Belarusian supplies to this country in the first half of 2015. Belarus has lost almost one billion dollars in export revenues in this single relationship. Three weeks earlier, on 24 July, Belarus and Ukraine already discussed the alarming downfall in mutual trade at a meeting of the bilateral trade and economic cooperation commission in Chernihiv, Ukraine. The two countries decided to draft "road maps" of cooperation in the spheres of manufacturing cooperation, energy, transports and logistics. After Kyiv, Vladimir Makei travelled to Odessa where he met Mikheil Saakashvili, the governor of Odessa region and former president of Georgia. The official explanation for this encounter was Belarus' interest in expanding its use of the transit infrastructure of Ukraine's south seaports. The peculiarity of this meeting is that Saakashvili remains one of the most hated personalities in Russia, in Belarus' closest ally. However, despite his strong pro-Western views, Saakashvili often supported Lukashenka in his contacts with influential Western leaders, as a token of gratitude for Belarus' refusal to recognise the breakaway Georgian regions. Despite the widely publicised strategy of opening new markets for its exports, Minsk still seeks to develop trade with its tried-and-tested partners. In May, Alexander Lukashenka visited Georgia. During the recent few weeks, besides sending his foreign minister to Ukraine, Belarusian president received his counterpart from Moldova, Nicolae Timofti, and Azerbaijani prime minister Artur Rasizade. Lukashenka reaffirmed that Chisinau's policy of association with the EU would not hamper bilateral relations or entail any retaliation from Belarus. Two countries have decided to move from regular trade to manufacturing cooperation. The knockdown assembly of Belarusian tractors and trolleybuses has already become a success. The next project is to start assembling Belarusian MAZ buses in Moldova. In its turn, Moldova will open a winery in Belarus. Alexander Lukashenka decorated Azerbaijani prime minister Artur Rasizade with the Order of Peoples' Friendship. These two political long-timers meet regularly to discuss economic relations between Minsk and Baku. As is the case with Moldova, Belarus prioritises cooperation in assembling Belarusian equipment in Azerbaijan. Belarus has been persistent in strengthening cooperation with its Eastern Partnership neighbours despite the fact that most of them adopted the policy of estrangement from Russia. Minsk has thus been demonstrating its preference for pragmatic approach and emphasis on trade rather than geopolitics.